canary tourmalines because of their fantastic colouring. 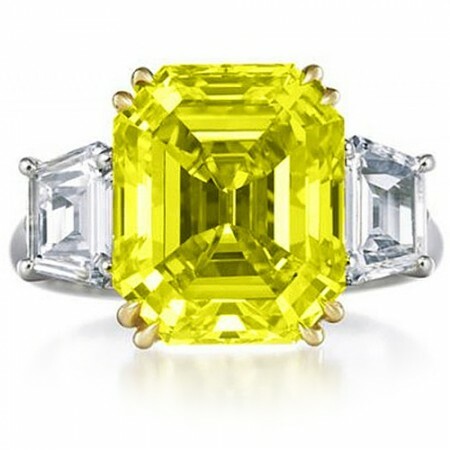 Pure saturated yellow tourmaline is very rare, they are sometimes called “canary tourmalines. More common hues are pale yellow and greenish yellow. Scientifically, tourmalines are one of the more interesting minerals, due to their wide colour range. It is a boron silicate mineral containing colouring elements such as aluminium, iron, magnesium, sodium, lithium or potassium. Its name comes from the Sinhalese word “turmali” or “thoramalli. Many crystals exhibit two or more colours; crystals displaying only one colour are rare. Tourmalines are mined everywhere in the world – Afghanistan, Australia, Brazil, Kenya, Madagascar, Nigeria, Pakistan, Sri Lanka, Tanzania, USA and Zimbabwe.